Complete Non-contact Inspection[Technology] OHT Inc.
OHT succeeded in commercializing the non-contact inspection technology for PCB and LCD glass panel for the first time in the world. 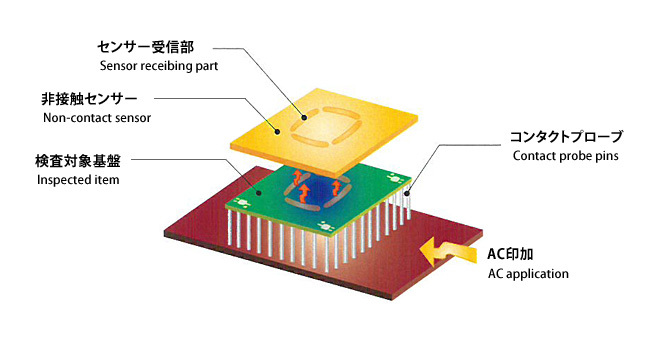 Pattern of Printed Circuit Board used in the most advanced products vecomes repidly fine pitch. Along with fine-pitch of Printed Circuit Board, the electric test width Non-Contact inspection method, developed by OHT, is also progressing. Printed Circuit Boards making good use of leading edge technologies and very delicate and hates scrath or particle caused by pin contact. Besides, Testing Fixture used in cantact inspections to fine patterns is very expensive, which bears down on running costs. As OHT's Non-Contact inspection technology solves such difficulties, it has been accepted by many customers and has achievements. With the high-speed test technology width our further advanced complete non-contact method, OHT supports Flat Panel industry such as increasingly high-definition LCD panel to provide stable products. OHT's Non-Contact inspection technology continues to develop further and support the cutting-edge technologies.